Attention all shoppers! 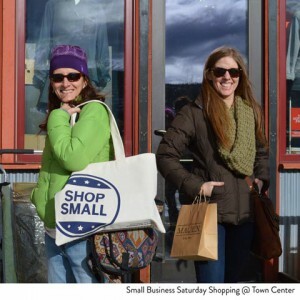 Mark your calendars for Big Sky's Small Business Saturday 2016 on Saturday, November 26. This is your chance to shop local and support Big Sky businesses. Everyone knows that the end of November is a busy time for friends, family, and shopping. It all starts with Thanksgiving (aka Big Sky Resort's Opening Day) then it's followed by Black Friday, Small Business Saturday, and Cyber Monday. It's a bit of a shopping blitz that has to mesh with riding the chairlifts and getting your first turns of the season. This shopping weekend is one of the busiest of the year and it's the ideal time to grab things you need for ski season or start knocking out your holiday shopping gift list. Big Sky's Small Business Saturday 2016 is organized by The Big Sky Chamber of Commerce and is part of the American Express nation-wide Small Business Saturday event. Please go out and make an effort to "Shop Small" on November 26. This is a huge opportunity to support local businesses and the Big Sky community. If you're ready to get your shop on, stop by the Big Sky Chamber of Commerce between 9 and 10 AM on Saturday, November 26, 2016 to kickoff Small Business Saturday. Coffee and mimosas will be provided - along with a local business Shopping Guide. There will also be four $50 gift certificates that will be given away that morning that can be used at participating stores on Small Business Saturday. Plus, every shopper will receive a canvas tote and other cool swag. You are highly encourage to participate! 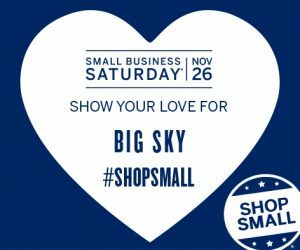 The Big Sky Chamber is still compiling the official list of Big Sky businesses that will be participating in Small Business Saturday. If you're a small business, contact the Chamber at info@bigskychamber.com or (406) 995-3000 to participate. If you're a shopper, grab your wallet and get out there and shop! There are plenty of places to shop in Big Sky and you'll find everything and anything that you need right here in our mountain town - hardware, furniture, outdoor gear, boutique goods, clothes, art pieces, food & beverages, and so much more. When you come and shop at Big Sky's Small Business Saturday 2016, you'll find something for every person on your list. Big Sky's Small Business Saturday is an event that you don't want to miss. Come and join your neighbors and support our mountain town community. Learn more about Big Sky's Small Business Saturday 2016 at BigSkyChamber.com.